While dealing with personal finance, setting goals are probably the most important step. And in order to achieve those goals, saving and investment play the biggest role. Savings means keeping money aside for future use. Investing means putting money or buying some assets in expectation that money will grow with the time. Here the intention is to increase money by using the available financial instrument in the market. Relationship between savings and investment helps to meet your personal finance goals. The savings and investments are important basically to meet following goals or needs. Here we will see some of the examples to understand the importance of savings and investment in the life. 1. Once in a While Expenses: Example: buying a computer, bike or a car, home improvement, going on summer tours, doing some random course, buying air conditioner etc. 2. Savings for Deferred Goals: Example: buying a home, higher education, child marriage etc. 3. Emergency requirements: Example: hospitalization, death, theft, natural calamities etc. 4. Lifetime Goals: Example: retirement, creating an estate etc. To cover-up once in a while expenses, generally, people save money by keeping cash in their homes, maintaining piggy banks, leaving some amount in their saving accounts, etc. To cover the deferred expenses, generally, people like to use one or more investment options offered by almost all banks. Some examples of deposit options are – Fixed deposit account, Recurring deposits, debentures, money multiplier fixed deposits, security deposits etc. To cover the emergency requirements, generally, people like to use one or few insurance options. Some of the insurance products are designed just to cover up the emergency needs like term-plan, health insurance, and all general insurance. Some are designed to accumulate wealth as well as to provide risk cover. Insurance is one of the most common investment instruments which people use to handle emergency needs. When it comes to emergency needs, insurance is the most suitable thing as it could give much more money than a person has accumulated so far. For example: A term plan with a sum assured of 1 crore rupees will give 1 crore rupees on the death of the insured, even if the total investment he has made is just one premium of few thousand rupees. This is one of the best saving tips one can suggest. There is no other better option available in the market which could match this facility. All other saving and investment instruments can just give you the total amount one has accumulated at the time of withdrawal. To cover life-long goals or even some deferred goals, there are several saving and investing options available in the market. Some of them are: demat accounts, bonds, public provident fund, mutual funds, sweep accounts, money market account, stock exchanges, etc. Here, the prime goal is the gain the maximum possible return on investment. But these things generally come with high risk, i.e. instead of quick higher gains; one could face quick severe losses as well. When you start managing your personal finance you will come across many savings and investment plans. It is also important that one should know the relationship and difference between savings and investment. Sound knowledge will help to pick better savings and investment options in your life. Here we will explain and distinguish between savings and investment and how it impacts the economic situation in person’s life in long term based on few parameters. Risk Saving account are low risk funds. In other words, it is terms as less risky capital investment option. Risk of capital investment differs from medium risk to high risk based on financial securities. Availability Withdrawal of your capital in savings account is quick and easy. It is useful when you are in need of emergency funds. Withdrawal of capital investment depends on the maturity date of your security holding. Early withdrawal may lead to penalties as well. Return Returns are low in savings account since risk of investment is also low. 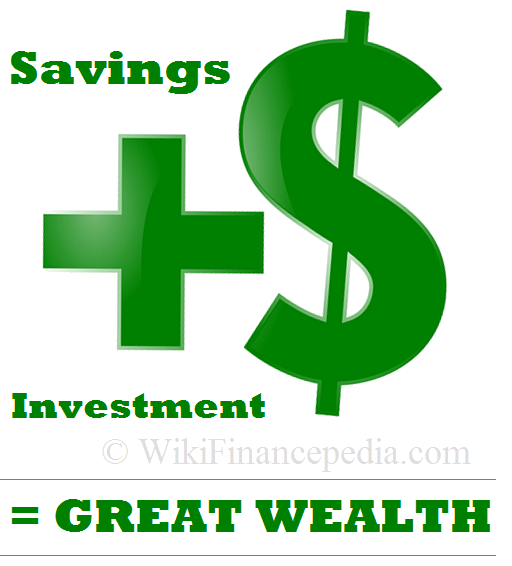 Return on capital investment are higher than savings account. As risk of investing is also greater than saving accounts. Inflation Interest received are normally below the inflation rate. Which means you are losing money in long term. Interest received are normally higher the inflation rate. Means you wealth is gradually increasing in long term. As there are different types of savings and investment options available in the market, so it is important to know your exact need and all the options that are available in the market to render those needs. Here are quick investment tips for applying which a person can easily figure out if a product is helpful. 1. When and How you’ll get your Money Back? Some banking products give increased money back faster than other. There are several products which can give you money back anytime you wish (like bonds, stocks, and mutual funds), but some products really restrict the ability to redeem the investments (like insurance, certificates of deposit etc.). As per IRDA guidelines, we cannot surrender our insurance policies before 5 years. Details here are too complex to wrap up the whole thing in few sentences. 2. When Earning will start on your Investment? Real estate investments, dividends, rents, stocks etc. instruments have their own time of return. Some property could give a good hike quickly (like a shop in the urban area), and some property will need years before return starts (like agricultural land in village area). 3. What will be the Return / Earnings? It is another important question to ask before going for any deposits or investment. In other words, what is the potential of the investment you are going to make? 4. What is Risk Level Matrix? Always remember, higher the risk, more the returns. Some banking products are bit shaky in terms of risk associated with them. A typical example is – investment in stock market. Its daily ups and downs in the share market. On some day, a person could have earned a handsome rise by afternoon and may come in a loss by the evening. Such high risky things are for those who are able to handle them, know how to play the game. 5. How Diversified Investment Portfolio it is? There is a great say – “Don’t lay all your eggs in one basket”. And this is very much true when it comes to personal finance (in fact, it’s true in all facets of life). The more diversification is, the better it is. 6. What are Income Tax Benefits? Is there any Benefit or not? It is always recommended that you should keep taxation in mind when investing is also a nice way to save optimum. You should evaluate the returns on your capital investment after income tax to compare and choose the best investment options. There are dozens of saving and investment options available in the market. We have to understand those options and match them with our requirement and goals. And finally, we should go for the best match options. Hope this tutorial chapter has help you to differentiate and understand the importance of savings and investment in managing your personal finance.